The damage caused by wild animals can be extensive if the problem has been left to its own devices for long enough. With bats, you don’t have some of the same troubles that you have with other nuisance wildlife. They don’t chew, for example, so any evidence of chewing is probably not going to have been caused by bats. One animal is known to attract another, however; so there is a chance that chewing + bats = more than one animal infestation. To start with, damp conditions are likely to precede mold, and if this is in an area of your home that you do not regularly inspect the mold can grow and grow and grow. Not only does this look unpleasant, but there are a string of health concerns that come hand-in-hand with mold – respiratory problems, asthma, allergies, and more. Guano by itself can cause a huge problem as well. A large pile of guano will start to seep through the materials it comes into contact with, making them unstable, soft, and wet. Bat droppings is naturally corrosive, so with enough time, that pile of guano could even start to disintegrate the materials. This could cause ceilings and floors to become structurally unsafe with enough time, and the waste itself could also drip through into the rooms below, causing staining and further damage. Disease is actually one of the biggest problems when you have ANY nuisance wildlife problem, and bats can bring a string of them to the party. Guano is responsible for the spread of histoplasmosis spores, which can be sent airborne and ingested with sweeping or incorrect cleaning methods. In fact, experts suggest that bats could be responsible for the transmission of over sixty different diseases that can be passed on to humans and other animals, more so than rats and other rodents in some cases. As well as worrying about rabies, bats could also carry and transmit Ebola, Nipah, SARS, and various other zoonotic conditions that can seriously harm human health. Of course, where the bat roosts and migrates will have a big impact on the kind of diseases the animal will be subjected to. Have you ever heard of bat bugs or bat mites? 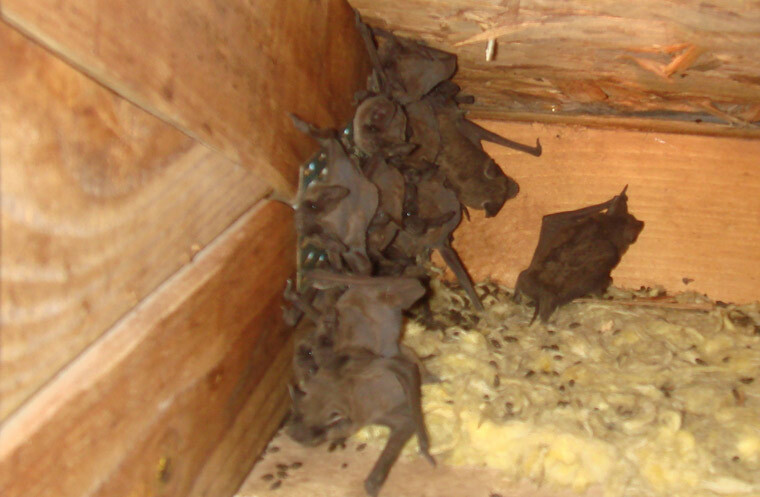 They’re a little bit like bed bugs, but they come with bats – the bat is the host and the source of food (bat blood). These mites will usually dissipate when you get rid of a bat infestation, but the mites themselves can live for up to twelve months without a host, and will also bite people and pets in a bid to get a viable blood food source. The good news is, bat bugs can’t survive without bats. Human and other animal blood just can’t sustain them. In cases where bat bug or mite populations are high after a bat problem, you may require a professional fumigant to get rid of them. Go back to the Bat Removal page, or learn about bats in the attic with my Bats in the Attic guide.